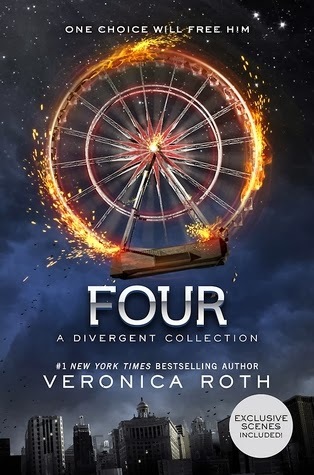 Fans of the Divergent series by #1 New York Times bestselling author Veronica Roth will be thrilled by Four: A Divergent Collection, a fourth volume in the Divergent series. Readers first encountered Tobias Eaton as "Four" in Divergent. His voice is an integral part of Allegiant. Readers will find more of this charismatic character's backstory told from his own perspective in Four: A Divergent Collection. When read together, these long narrative pieces illuminate the defining moments in Tobias Eaton's life. The first three pieces in this volume--"The Transfer," "The Initiate," and "The Son"--follow Tobias's transfer from Abnegation to Dauntless, his Dauntless initiation, and the first clues that a foul plan is brewing in the leadership of two factions. The fourth story, "The Traitor," runs parallel with the events of Divergent, giving readers a glimpse into the decisions of loyalty--and love--that Tobias makes in the weeks after he meets Tris Prior. I read the first book ( Divergent) in the series out of curiosity. Everyone speaks so warmly of the author, so why not I thought. I really should stop doing that every time I see a book I think looks interesting or people speaks warmly of in this genre ( because I'm not exactly a big fan of the genre, unfortunately) So...Nah! I did not hate the book. I guess that's step forward in the right direction. The book was good by all means, but it was not quite for me. Having said that, I loved Four, really want to read a book about him. I love Four as well! But I don't know if I can go back in time after ALLEGIANT. I'm still sad about that book. However, if I could do it for anyone it would be for him. Great pick. I´ve read Divergent and I liked it but I haven´t read the rest of the books. I read one of the short stories and I really liked reading from Four's POV. I still have to read Allegiant, so maybe these short stories will finally get me in the mood for it! Oh my god! Is there comming a book about Four?? Wooow! That sounds sooo good. I really want to read it! I so need to finish this series! I enjoyed the first one, but have made it through the rest. Can't wait for the movie, either! Sounds good, and love the cover. hope you get to read it soon. I have to agree with everyone saying that didn't like the way Allegiant was written in both Four and Tris's point of views. I'll have to get my hands on a copy of this one! Awesome choice! Ooo, yes! I loved this series (although I have not read Allegiant and probably won't for a while). Hope you love it, Carina! I'm altogether too afraid to read Allegiant! One day I definitely will, but everyone's disappointment has put me off. But, I seriously love the cover for this, and I always liked Four. :) Great pick!! *hangs head* I still need to read book one in this series. I adore the covers of these books, but I haven't read them yet! I'm glad to hear you're enjoying them, Carina! I haven't actually read these books, but this is such a fun idea. I know if it was series I loved, I would KILL for a fun short-story book.